I got obsessed with making Dahi Kebabs a month ago. I’ve made it at least three times in two different ways, and this will be the fourth. Early last month, when I realised I’d made a whole bunch of yoghurt dip for a couple of dinners and and little bits of it got left over, I got the idea to stuff it in bread and fry it. Didn’t want any dip going to waste. Since then, I’ve made Dahi Kebabs three times this way and once in cutlet form. 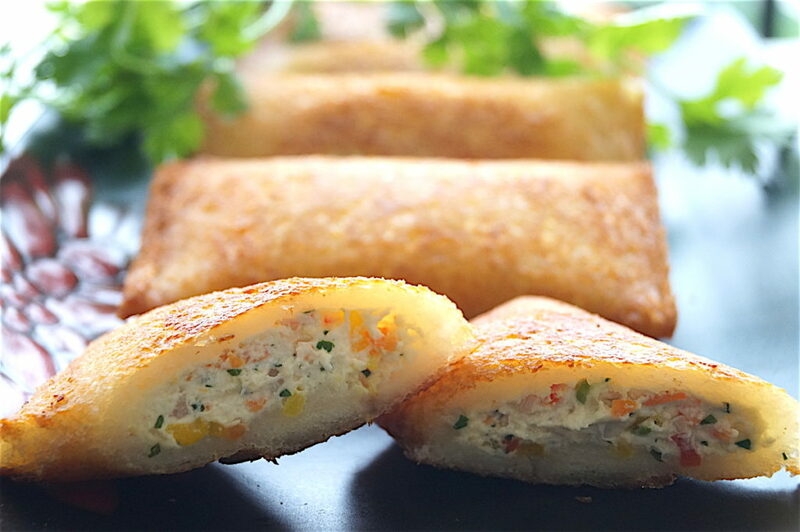 This way, yoghurt filling rolled in bread, seems to have found more favour with the family especially the brats who at this point in life have no issues with weight or cholesterol or any of the problems related to overindulgence in all yummy tasting things that adults seem to have. The dish’s journey to the blog has been quite eventful. The first two times, there was too much moisture in the yoghurt filling so I had to add breadcrumbs. Also, the second time I made a huge batch. Third time lucky they say, and it held true for me. I found the right consistency and balance of flavours and Voila! here we are. This is a very crispy and tasty dish, albeit a bit heavy with the deep fried bread, but hey – those are always the best parts right? One can indulge sometimes. 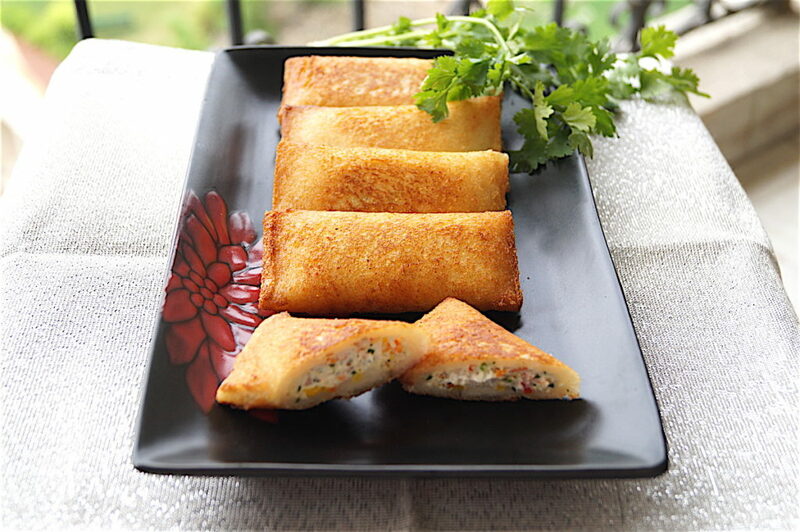 It is a popular dish with Indian food caterers and at weddings and we’ve all enjoyed it at those occasions. 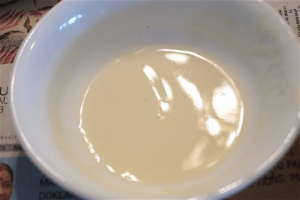 The key here is to get thick yoghurt and have it hanging in fine muslin cloth for a long time so that there’s no whey (water) left to loosen the curd and as a result, you will not need a binder such as breadcrumbs. I hung 600 grams of yoghurt (I used Nestle A+ brand) for 12 hours and got exactly 200 grams of the curd after all the whey dripped out. Keep a container under the hung yoghurt to collect the whey. 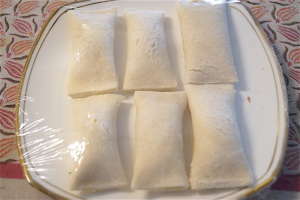 Whizz the paneer (cottage cheese) nicely till smooth and chop all the ingredients very finely. Believe me, you do not want a large chunk of onion or ginger or red pepper in your mouth. All the flavours have to meld beautifully to give you a well rounded bite. Another thing, the dish is better eaten the next day as keeping it for another day or even two in the fridge allows all the flavours to really sharpen. Roll the bread finely. There should be no sponge left on the bread. Your enjoyment of this dish will depend on how meticulously you have gone about preparing it. There is little room for error, yet, it’s actually very simple to make. Also, please DO NOT throw away the whey that collects in the container below. It is packed with nutrients and can be used to knead chapati dough as well as had as a drink mixed with black salt and roasted cumin. I got the bread rolling technique from a youtube video on nishamadhulika.com. Was a wonderful and easy way to do it. I’ve changed it up here though. Try this dish. It’s a crowd pleaser. 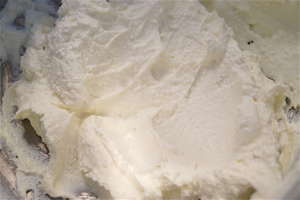 600 gms thick yoghurt hung in fine muslin cloth for 12 hours (you will get 200 gms of curd). Collect the whey (water) in the fridge. Do NOT throw. Cube the paneer and blend it in a mixie or food processor till smooth. If you don’t have either of those, mash by hand or an egg beater. 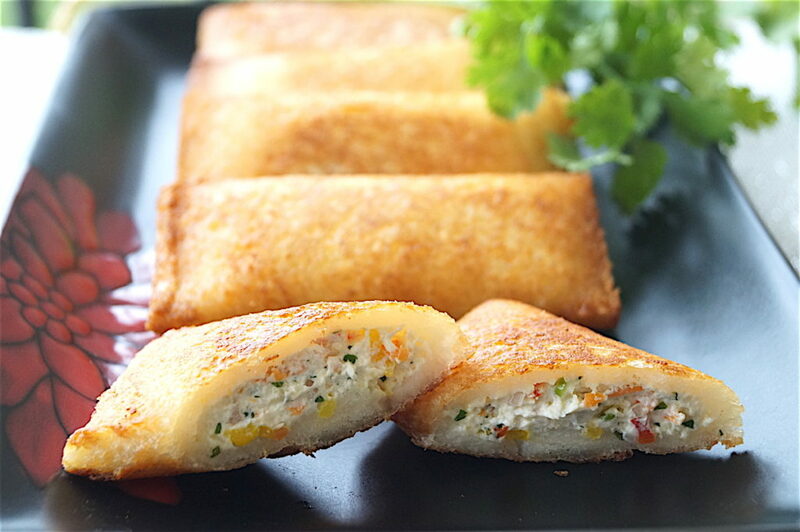 Mix the paneer and all the ingredients under ‘hung curd mix’ together nicely and set aside. 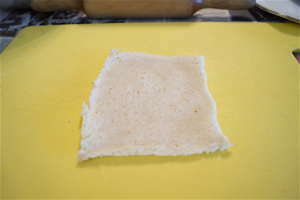 Cut the edges of the bread and roll the slice flat with a rolling pin till the bread is about 1mm thick. Flip the bread over and brush water all over the surface. Not too much. It should not become soggy. Turn the bread over again keeping the dry side up. 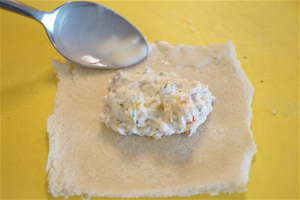 Add one tablespoon of the hung curd mix into the centre of the slice keeping at least 3/4 inch space on either side. 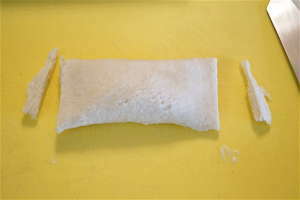 With the back of a spoon, line the top and the two sides of the bread with the flour paste. Do not line the bottom. 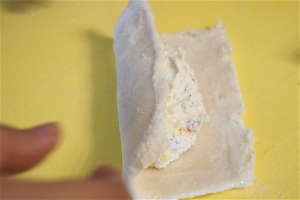 Raise the bottom part of the bread slice over the hung curd mix and stick it to the the flour paste covering the top of the slice, making sure the seam is sealed well and no filling is seeping out of it. Press the sides of the bread together to stick them. Make sure the top doesn’t break. Can cut off a bit of the sides if they look untidy. Do this till you finish all the hung curd mix. Arrange the parcels on a flat dish side by side. Do not place one on top of the other. 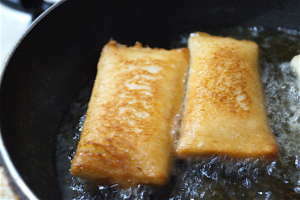 Shallow fry the parcels in a pan with about 1cm of oil up the sides on medium to medium-high heat depending on your stove till they are golden brown on all sides. Do not fry them on high heat. It will make them too dark. Can keep it for two or three days in a well cooling fridge and then fry it. The longer you keep it, the better the flavour. Do not fry and then store. 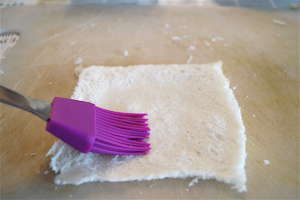 Once they’re done, remove onto a plate lined with a paper napkin to absorb the excess oil. Cut into half and serve immediately. Can serve it with a mint or coriander chutney or even ketchup or chilly sauce. 1. 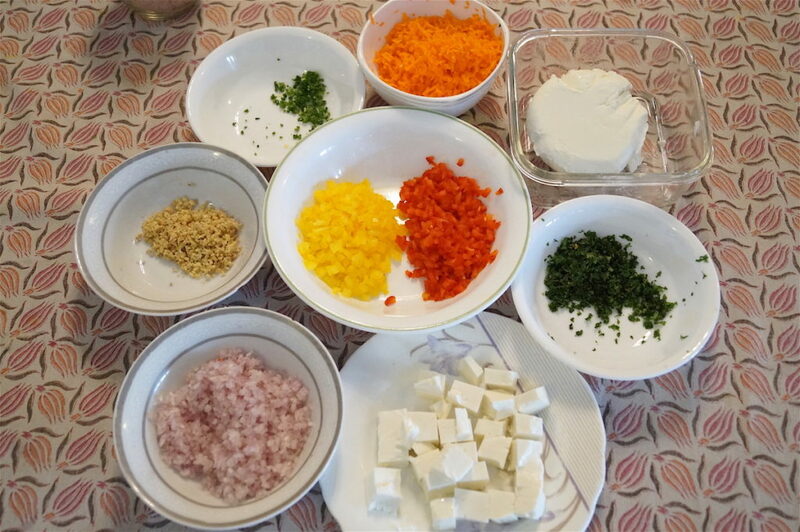 Whizz the paneer (cottage cheese) in the food processor. 2. Mix paneer well with the hung curd. 3. 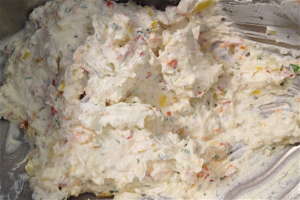 Add all the onions bell peppers and aromatics to the hung curd mix. 4. 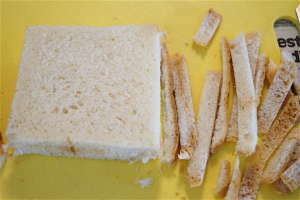 Cut the edges of 12 slices of fresh bread. 5. 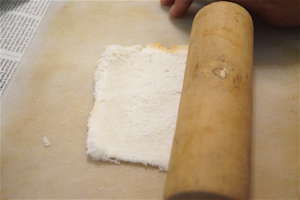 Roll the slices flat with a rolling pin. 6. 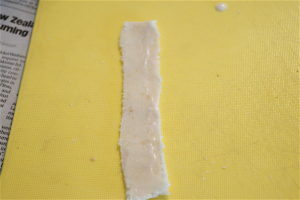 Roll evenly to 1mm thickness, including the edges. 7. Flip over and brush the side with water all over. 8. 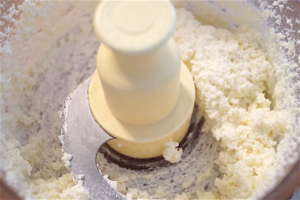 Mix 1 tbsp flour with 4 tbsp water to make a paste. 9. 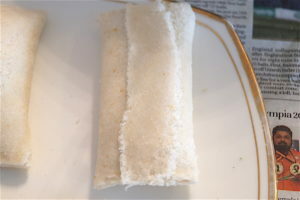 Place one tbsp of the hung curd filling neatly in the centre of the rolled slice. 10. 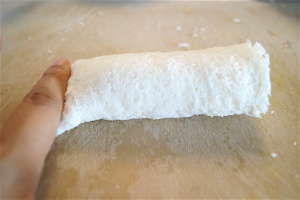 Line the top and side edges with the flour paste. 11. 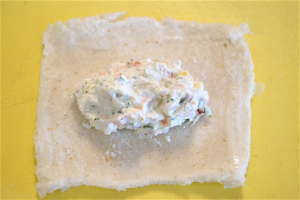 Roll the bottom of the slice over the filling. 12. And stick it to the top. 13. Till you get this. 14. Press the sides of the roll to stick them. 15. Cut off the excess edges if you wish. 16. Arrange them on a plate and cover with clingfilm and refrigerate for upto 3 days if you wish. 17. 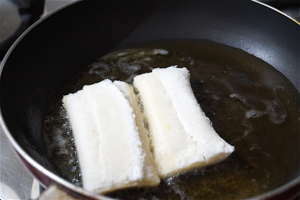 Fry in oil medium to medium-high heat. 19. 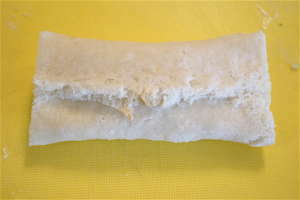 If your filling becomes too much and your roll edges do not seal, cut out a long strip pf bread, roll and line with flour paste. 20. Stick it over the seam.